Mamma Mia: Here We Go Again was just released in theaters a few weeks ago. I saw it (because why wouldn’t I?) and I have to say, to my surprise, I was bawling for a good portion of it. The storyline and the songs really just moved me. The two films feature some of the best soundtracks that I’ve heard to date. Plus, I’m just a huge sucker for musicals. For me, Mamma Mia stands above all else. Here’s my list of the top songs from the newly released sequel. In case you haven’t seen it already, spoilers ahead! Their songs give me a giddy feeling and I just want to sing at the top of my lungs. The songs always lift my spirit and cheer me up immediately. My friends and I always listen to when we travel and Mamma Mia has been my go-to road trip playlist since 2008. The in-car dance party and bad singing have become a tradition all their own. And finally now 10 years later I can add a few more songs to that list. I’ve digressed, I know, but I love it so much! Back to the best song list! This was probably the saddest song of the whole film. Bring on the waterworks! I don’t know anyone who wouldn’t be moved by this song and scene. It was so perfectly done and really makes you appreciate the people you hold dear to you. Meryl Streep made one appearance during the movie and the song she sings is all about the bond a mother and daughter share. It was heartwarming, yet also heart-wrenching knowing that Donna had passed. It was truly beautiful. I loved this song because it beautifully captured the young free-spirited Donna. She wasn’t afraid of anything. I also just loved the way Lily James sang this song. She had barely just started her adventure of falling in love with the island when she starts to fall in love with the new guy she’s just met. It was more than just a love song. It’s her exclamation that she was ready to take on the world no matter what was thrown at her. This song was featured in both movies because it’s just that great. And it really captures the spirit of the film. Whether you’re a fan of the Mamma Mia movies or not, Dancing Queen is a gorgeous song. Both Sophie (Amanda Seyfried) and her mom Donna (Meryl Streep) are ambitious, passionate, and go-getting women. A lot of that sparks from their desire to perform and make the most of their lives. In the film young Donna (Lily James) says, “I want to make some memories” and she does just that. Dancing Queen is the perfect song to show the lively spirit of the film and its characters. The film is about love, finding yourself, and adventure. Of course, this one would be a crowd favorite because it has Cher in it. That’s enough to make me love it alone. This scene is one of those romantic over the top love story reunions that only happens in movies. There were even fireworks. It was all the cheese, but that’s part of the reason that makes it so great. If you haven’t seen Mamma Mia 2: Here We Go Again I can’t recommend it enough. I was worried that after 10 years my expectations would be too high for this film, but it surpassed my expectations. The 10-year wait was more than worth it. The thing I love about this movie is that it makes you feel an array of emotions. Songs can make you feel emotions that words alone can’t. It’s probably why I have such a soft spot for musicals. Even though the premise of this film is a bit melancholy, it still makes you laugh, smile, and gives you hope. The songs are just the cherry on top of this film cake. 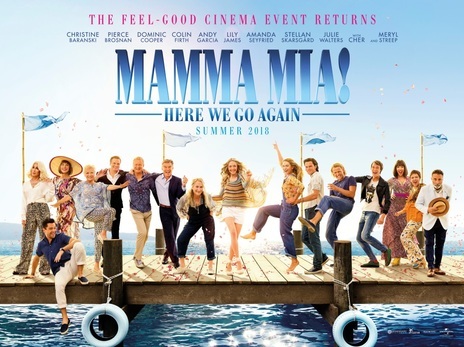 Mamma Mia: Here We Go Again excelled in incorporating the songs with the storyline to make this a classic must-see musical. Did you see Mamma Mia 2? What did you think? Tell us below!